This crochet hooded baby blanket pattern makes an easy and inexpensive project to crochet for children’s charities. 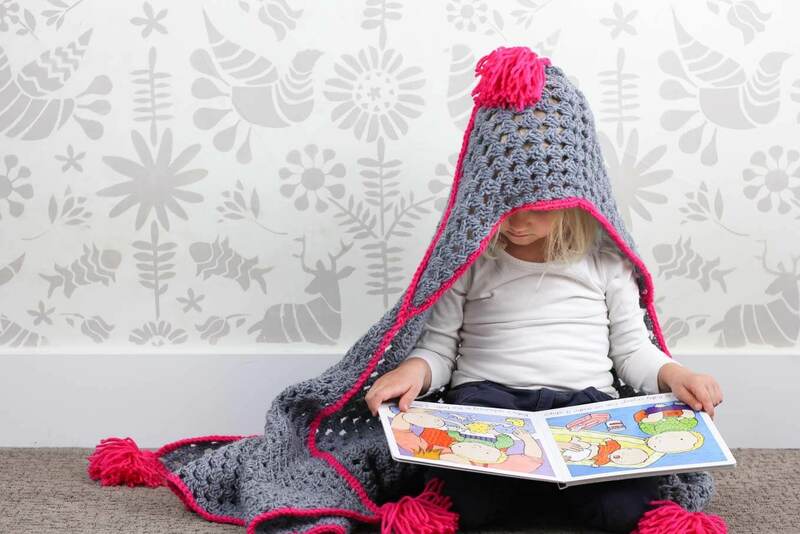 The oversized hood and playful tassels will give any kid a safe, warm place to escape to. 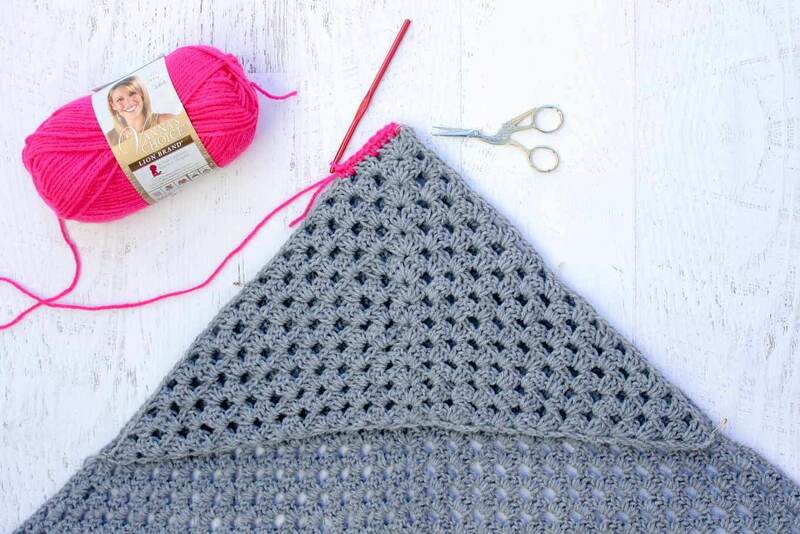 This hooded baby blanket pattern is a collaboration with my friends at Lion Brand Yarn. This post contains affiliate links. Cozy. Safe. Carefree. All babies and kids deserve to feel this way. So when Lion Brand Yarn invited me to join in their Yarn Heroes charity project, I knew a crochet hooded baby blanket would make a wonderful project for kids that need a little extra love or security in their lives. Enter: Miss Make & Do! She’s a super hero! She’s a crocheter! She’s a slightly odd woman who wrapped herself in a pom pom rug and took hilarious photos with her husband and daughter “creative directing” the shoot. During this season of thoughtfulness, Lion Brand is helping to encourage all knit and crochet lovers to use their creativity to help others with some charitable crafting. 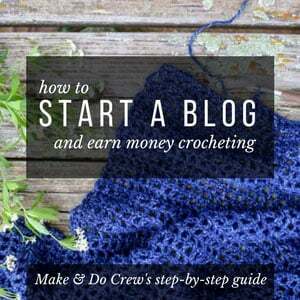 I’ve teamed up with 14 of my favorite crochet and knit bloggers for a month of benevolent stitching. We’ve got a whole lot of free patterns and free yarn for you in the coming weeks! 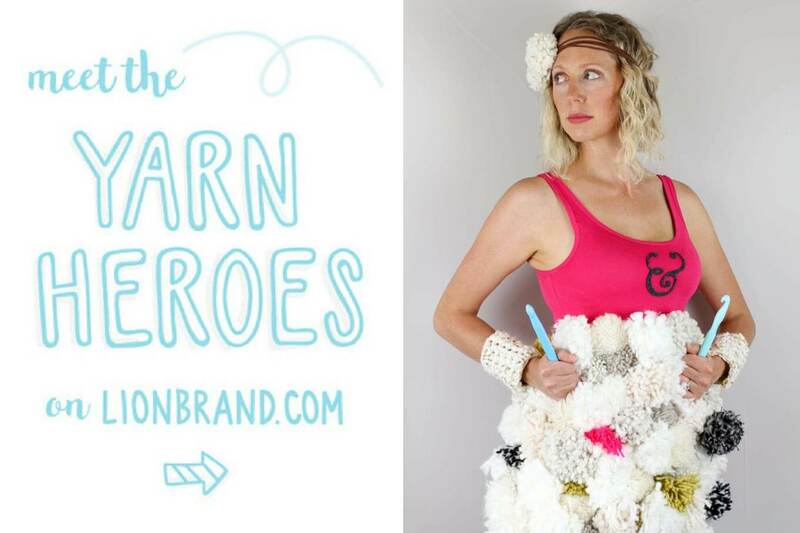 Learn more about how Lion Brand is creating a more giving world by crafting for a good cause on LionBrand.com and see each Yarn Hero’s free pattern on Lion Brand’s blog, The Notebook. In the coming weeks, I’ll share which charity I’ll be donating my hooded blanket to and tell you how you can contribute too. 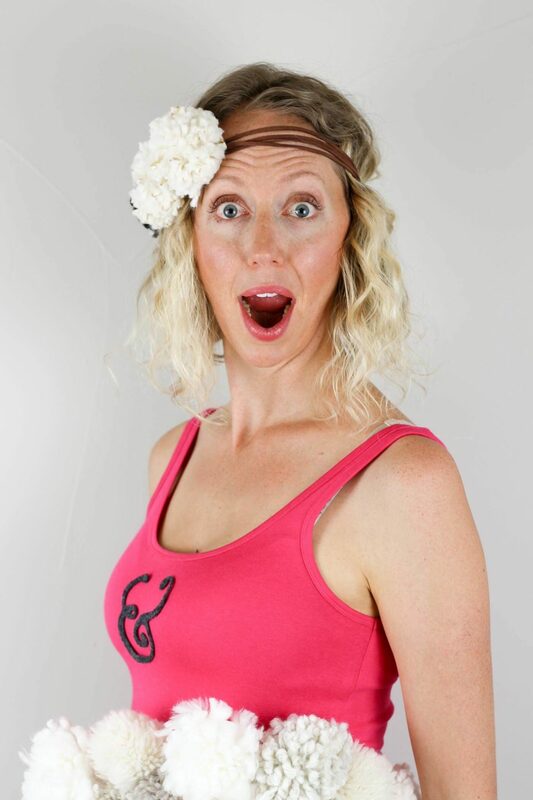 Plus, I’m going to have some free yarn coming at you next week! In the mean time, feel free to get started on this quick and gratifying blanket pattern and use the hashtag #yarnheroes on social media so we can follow along! 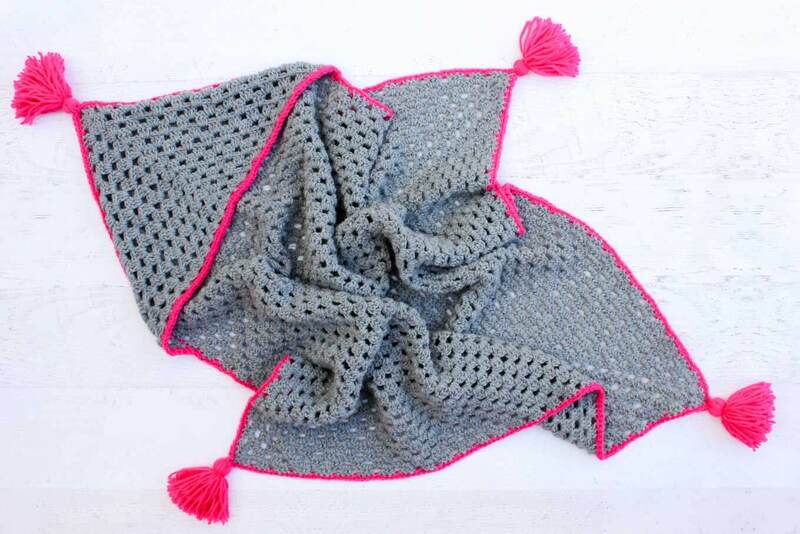 My “Granny Gives Back” crochet hooded baby blanket pattern is based on a basic granny square with a modern twist–tassels! Well, these tassels or more like pom pom tassels (pom-sels?) because they’re pretty fluffy, but I think that they’re a fun accent for little fingers to play with. The pattern included two sizes: newborn – 6 months and 6 months – child. The hood is intended to be oversized on both, but I wanted to give you a slightly less bulky option if the afghan you’re making is intended for a very young baby. 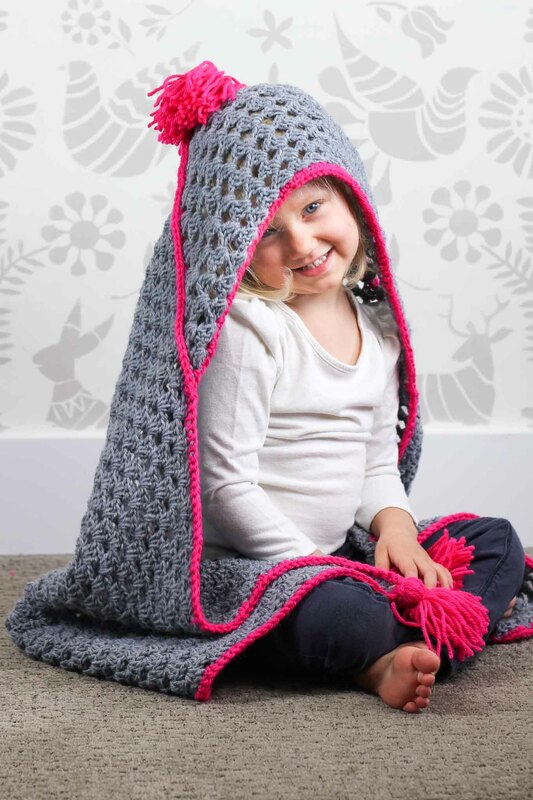 The hooded blanket pictured is the 6 months – child size. The entire afghan can be made with less than one skein of Lion Brand Pound of Love and one skein of Vanna’s Choice. My hope is that this makes it an economical gift for charity crocheting. Perhaps you’ll even make a few?! I know you all are a generous bunch! The blanket can be easily customized for a boy or girl or remain gender neutral based on the colors you choose. And to make your charitable crocheting even more doable, Lion Brand is offering $5 off for every purchase at or above $20 until December 15th on LionBrand.com! Just use the code YARNHEROES2016 at checkout. Show your “moral fiber” and go big! Please do not publish or share this pattern as your own. You may make items to sell or donate with this pattern. In exchange, please link back to this post. View my policies for more info. Do NOT use my photos as your own sales photos. ­­Now go make something awesome! Purchase the printable, ad-free PDF for $2.75 here. Add this pattern to you Ravelry favorites here. So you can spend more time making blankets and less time shopping, this pattern contains affiliate links at no extra cost to you. Do not turn at end of rounds, but continue with RS always facing you. Round 1 (RS): Ch 5 (counts as 2-ch sp and 1 dc), [3 dc in ring, ch 2] 3 times, 2 dc in ring, join with a sl st to top of third ch from beginning of round. Round 2: Sl st into first 2-ch sp, ch 5 (counts as 2-ch sp and 1 dc), [3 dc in same 2-ch sp], *ch 1, [3 dc, ch 2, 3 dc] in next 2-ch sp, repeat from * twice more, ch 1, 2 dc in sl st from beginning of round, join with a sl st to top of third ch from beginning of round. Round 3: Sl st into first 2-ch sp, ch 5 (counts as 2-ch sp and 1 dc), [3 dc in same 2-ch sp], *[ch 1, 3 dc] in next 1-ch sp, ch 1, [3 dc, ch 2, 3 dc] in next 2-ch sp, repeat from * twice more, ch 1, 2 dc in sl st from beginning of round, join with a sl st to top of third ch from beginning of round. Round 4: Sl st into first 2-ch sp, ch 5 (counts as 2-ch sp and 1 dc), [3 dc in same 2-ch sp], *[ch 1, 3 dc] in each 1-ch sp until next 2-ch corner, ch 1, [3 dc, ch 2, 3 dc] in this 2-ch sp, repeat from * twice more, ch 1, 2 dc in sl st from beginning of round, join with a sl st to top of third ch from beginning of round. Repeat Round 4 until square measures 25 inches across (approx.. 21 rounds total). Fasten off. Repeat Round 4 until square measures 35 inches across (approx. 29 rounds total). Fasten off. Note: The first and last granny clusters of each row should have four total stitches instead of three like the rest of the clusters. Row 1(RS): Ch 3 (counts as 1 dc), 3 dc in ring, ch 2, 4 dc in ring; turn. Row 2: Ch 3 (counts as 1 dc), 3 dc between first and second dc, ch 1, [3 dc, ch 2, 3 dc] in 2-ch sp, ch 1, 4 dc between last two dc; turn. Row 3: Ch 3 (counts as 1 dc), 3 dc between first and second dc, [ch 1, 3 dc] in next 1-ch sp, ch 1, [3 dc, ch 2, 3 dc] in 2-ch sp, [ch 1, 3 dc] in next 1-ch sp, ch 1, 4 dc between last two dc; turn. Row 4: Ch 3 (counts as 1 dc), 3 dc between first and second dc, [ch 1, 3 dc] in each 1-ch sp until corner, ch 1, [3 dc, ch 2, 3 dc] in 2-ch sp, [ch 1, 3 dc] in each 1-ch sp, ch 1, 4 dc between last two dc; turn. Repeat Row 4 until hood measures 6 inches from initial round to top point (approx. 8 rows total). Repeat Row 4 until hood measures 11 inches from initial round to top point (approx. 13 rows total). While crocheting border, work over tails from fastening off blanket and hood to avoid weaving them in. With WS of blanket and WS of hood facing, line up one corner of the blanket with the hood. Use stitch markers or safety pins to secure pieces together. (See photo A.) Keep RS of hood facing you to work the border. Using BC, make a slip knot around your crochet hook, enter hook through 2-ch sp at top of hood, pull yarn through 2-ch sp and through slip knot to join yarn to hood. Border Round: Ch 1, sc in each st including 1-ch sps. 2 sc in each 2-ch sps at corners. Join with a sl st to first sc of round. Fasten off. Repeat slip knot process to attach yarn to bottom right corner of hood. 3 sc in each dc along bottom edge of hood. Join with a sl st to border on left side of hood. Fasten off. Watch this :60 video see exactly how I made my tassels or read the written instructions below. Using BC, lay a 15 inch piece of yarn parallel to the 7 inch edge of your cardboard piece. Working perpendicularly to that piece of yarn, wrap yarn around cardboard approx. 50 times. Tie the 15 inch piece of yarn around the 50 strands of yarn and secure with several knots. At opposite edge of cardboard from the gathered wrap, cut all fifty strands of yarn. Fold strands in half into a tassel, with gathered wrap at top. Approx. ½ inch below gathered wrap, wrap a new piece of yarn around the tassel and secure with several knots. Thread tapestry needle using what’s left of the original 15 inch length of yarn and sew tassel into 2-ch sp of blanket corner, taking care to wrap yarn through tassel and 2-ch space several times and securing well with a few knots. Make 4 tassels. Weave in any remaining ends. 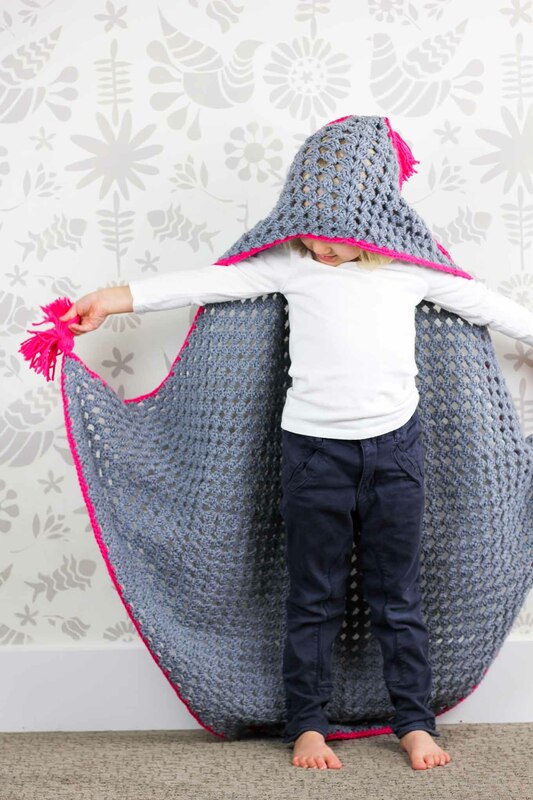 Pop this cozy cloak on the nearest kid—you’ve just made their world a whole lot warmer, comfier and more yarn-tastic! Thanks so much to Lion Brand Yarn for providing the awesome yarn for this project. I’m so proud to be part of this generous and creative group of bloggers. Be sure to check out my fellow yarn heroes for more inspiration. I love to see your finished projects! Use #MakeAndDoCrew and #yarnheroes and tag me Instagram (@MakeAndDoCrew) to show off your stitches and have a chance to be featured. I was just saying last night at our Homeschool mom’s group meeting, that I’d like to make a blanket or lovey for the Foster Closet a couple of the mom’s are running. Something that’s never been used before that’s just the child’s no matter what!. I think I’ve found it. Thank you SO much for making this free. I didn’t know they were doing that, I’ll send a message now, thank you! Thanks, Jess, for this adorable pattern. I do charitable crochet for a group in Livingston, Texas called Hook ‘n Needle. We make baby items for the local hospital nursery, and we also provided for foster care children as well as CPS children at Christmas time. It’s such a great way to share our abilities and gifts. 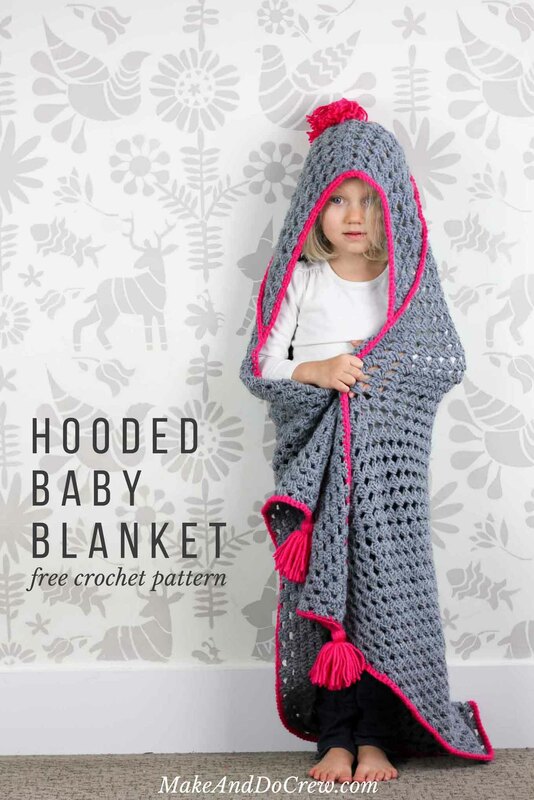 I love this little hooded blanket pattern, and I will show it to our group to share. I think they will love it! thanks again. How wonderful, Connie! Those kids are so lucky to have a thoughtful group like yours making handmade things for them. I hope your group finds this pattern useful! I’m in! Thank you so much for asking me. 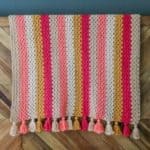 I’m not very savvy on the computer, but would love to crochet some blankets for kids. What a nice idea. I am a retired great-grandma and love to crochet. But I do not go on Facebook or any of the other places. I do use e-mail. If you’d like to send Lion Brand an email and tell them how you’d like to do some charity crocheting, they might choose you to receive $250 worth of free yarn for your charity projects! You can reach them at [email protected]. Thanks for using your crocheting skills and creativity for such a good cause! It is so heart-warming to read about Yarn Heroes, like yourself. Do you know of any groups in the Philadelphia, Pennsylvania area. I love to crochet and will be making your afghan and will be sharing your story. I am not familiar with any groups in your area, but I do know there are a lot of national charities looking for donations. I’m going to be giving my blanket to Project Linus and you can look for a local drop off point near you right here. Thank you so much for using your creativity to help others! I found the pattern. Never t easy to find and follow with so many pop up ads, sorry to say. Whike aI appreciate very much this loose vely pattern and the charity work you do, I would be illing to pay for a pdf rather than deal with tryingvto navigate through so many pop-ups. This would be wonderful done in super hero colours also! If you make one in super hero colors, I’d really love to see it! There is something wrong with your tassel video. It go to a Walmart sale for crockpots when I click on it. Thank you so much for letting me know about the video issue. I think that you might have clicked on the ad that comes before the video, because I just saw the same crockpot ad. The bigger problem though is that for some reason the videos aren’t loading after the ad plays. I’ve sent an urgent message to the company that hosts my videos to find out what is going on. I’m so sorry for the inconvenience! I hope to get this sorted out asap! I am an avid knitting but would love to try crocheting and this project seems like a wonderful reason to start! Tell me, is it a relatively beginner pattern? I am a quick study, but have never crocheted. Thanks for any input! Oh, and thank you for your charitable works, it matters! Weird, I posted earlier and it disappeared! I hope this is not a double posting. I mentioned that I am an avid knitter, but I would love to try my hand at crocheting. This looks like a lovely start, for a worthy cause. I am wondering if it could be a beginner crochet project. I am a quick study, perhaps you might have, or know of, a video or two that might help me get started? Thanks so much, and thank you for your charity work. Hope you’re all clear now! I would love to win this giveaway because I am currently making crochet Christmas presents for children that wouldn’t otherwise have anything to open Christmas morning. Everyone deserves something to open especially the little ones. This giveaway would help me supply more items. I totally agree, Holly! Thanks for your thoughtful response. Good luck in the giveaway! 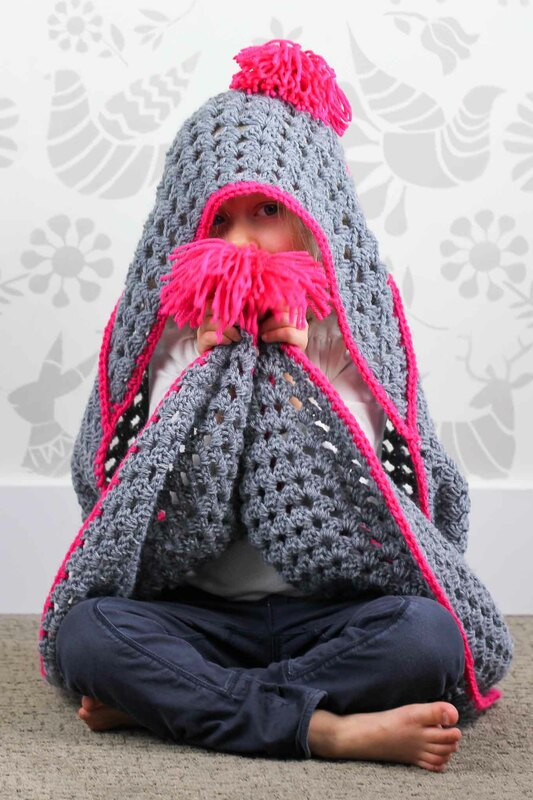 I have a very seriously ill little girl age 10 I’d like to make this granny hooded blanket for. but I would need a larger size for sure. dO YOU HAVE A ENLARGED PATTERN AVAILABLE? How wonderful that you’d like to make something special for her. 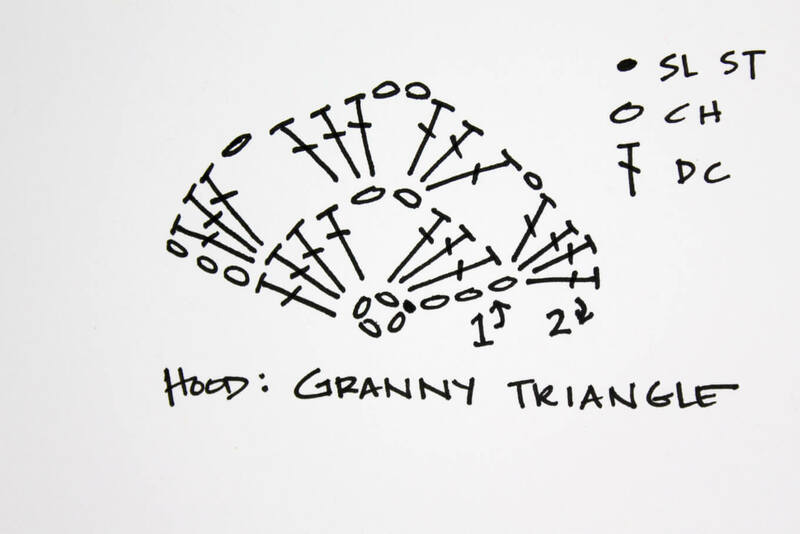 I think you could actually just continue the granny square until it’s the size you’d like and then do the same with the triangle hood. 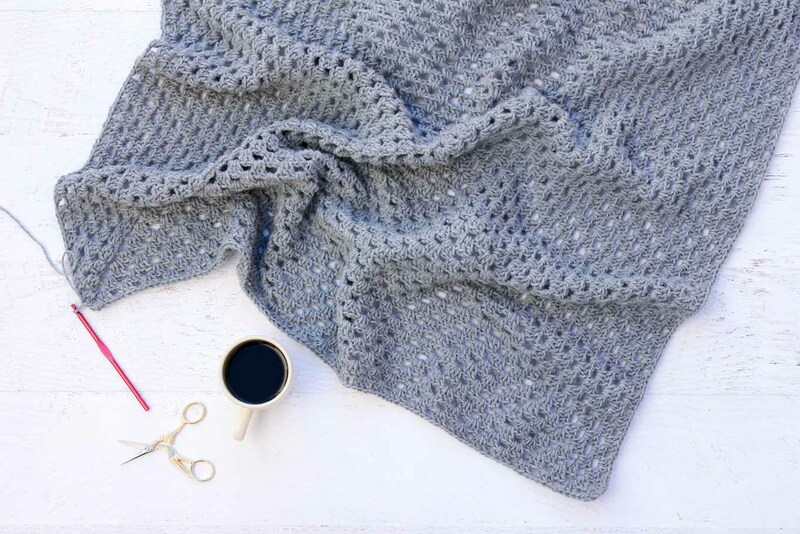 Both elements of the blanket are really customizable by just adding more rows and continuing in the same pattern. I hope that’s helpful! Let me know if it’s not clear enough and I’ll try to give you more details. Your comment made my day. I feel so lucky to have gotten to be part of the Yarn Heroes campaign. It’s been really inspiring to me to hear from so many readers who regularly make items for charity. There are so many real life yarn heroes out there! That’s awesome! You’re a granny square queen Rachael! 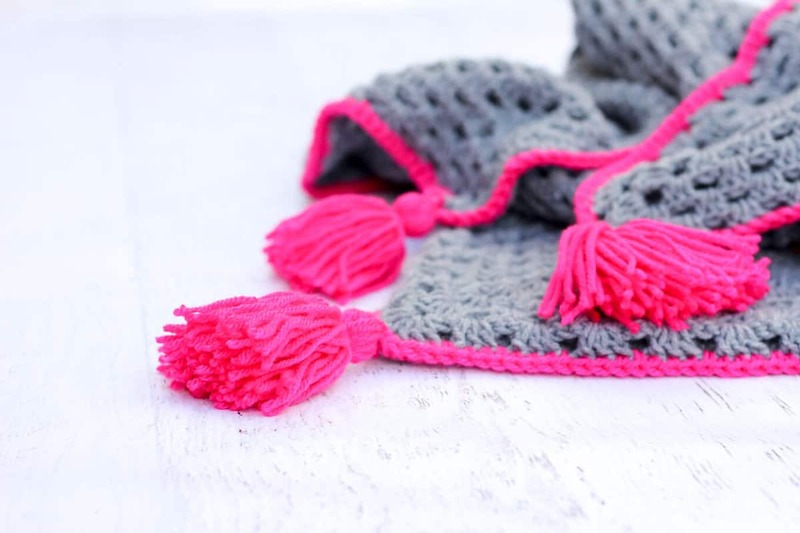 Love the tassels on this blanket!! Do you think if I just kept adding rows I could make it large enough to fit a 10 year old? My granddaughter is 13 but tiny and wants a blanket to wrap up in to watch TV. Oh yeah, that’s a great idea to make an adult version. I’d love to try that!